We have been BUSY here at Casa Lola over the past few weeks, so let’s start by filling you in on our most recent adventure, shall we? 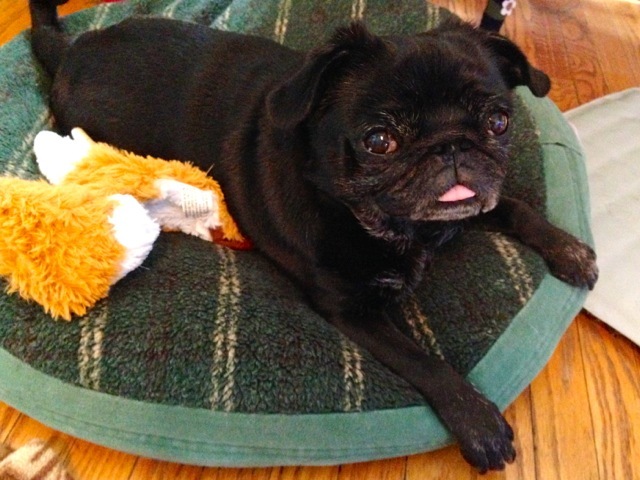 I woke Lola Pug up the other day to tell her the exciting news that we were about to have a house guest. *Lola Pug: This is entirely untrue. The human lies terribly. 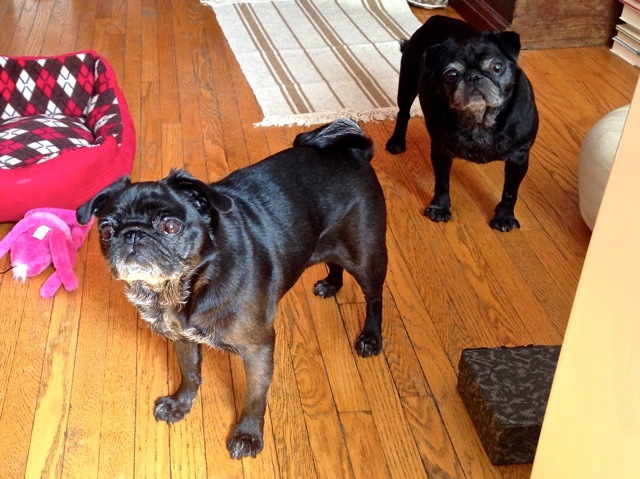 We have been hosting and having play dates with Nelly going on nine years now, so these two are not only sisters from the same mister, but they are also old friends. 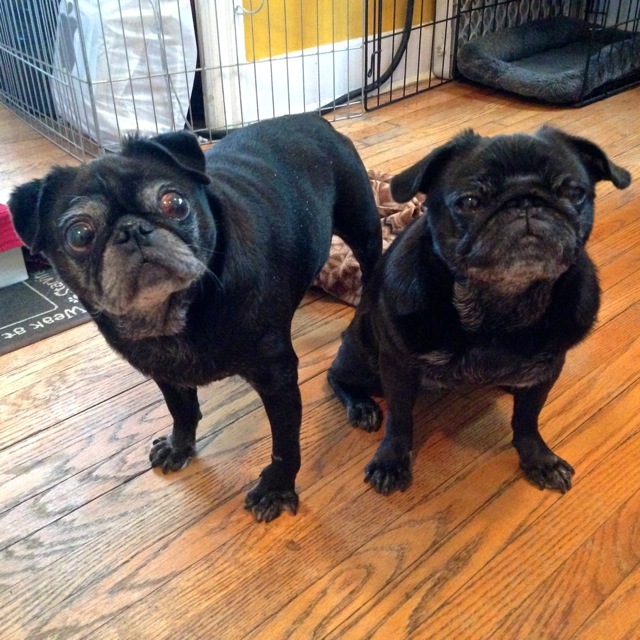 Both Lola Pug and Nelly are getting higher up on the pug seniority list, and age typically brings health developments along for the ride. 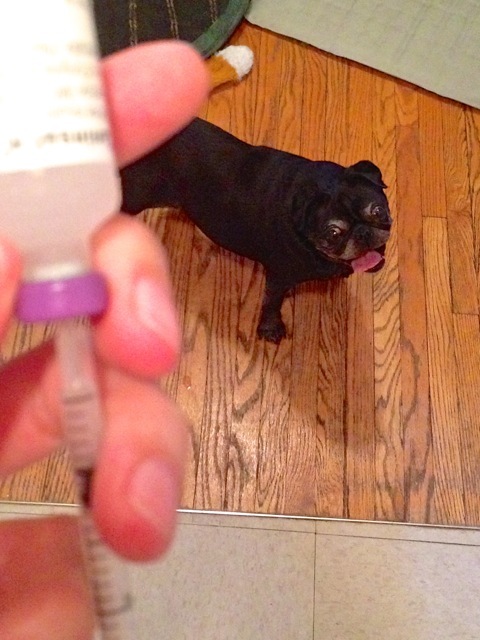 We noticed a while ago that Nelly was starting to act “not herself”, so her people whisked her off to the pug doctor, and they did so not a moment too soon. Nelly was diagnosed with diabetes! Now, I am *that* person who needs to look away when I get a blood test or a vaccination. When I was a kid, it once took three nurses to hold me down for my annual blood test. (not my proudest moment) But now that I’m slightly more grown up, I think of happy places and chocolate and baby pugs, and I usually make it through with minimal embarrassment. Needless to say, I saw this new development in Nelly’s care as a long overdue challenge that it was time I faced head on. It was the perfect opportunity to overcome a silly phobia, and the chance to do it for love. It was NBD, as the kids say. After a tutorial by Nelly’s humans, as well as many discussions with friends whose dogs have diabetes, I was ready for action. And I had a schedule. I always need a schedule. 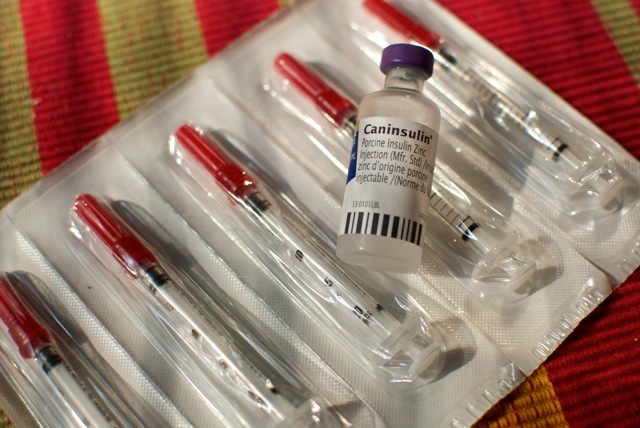 Turning the vial gently 10 times to mix the insulin so that I don’t create any bubbles…needle in…drawing out… just like I’ve seen it done a million times by people much smarter than me. 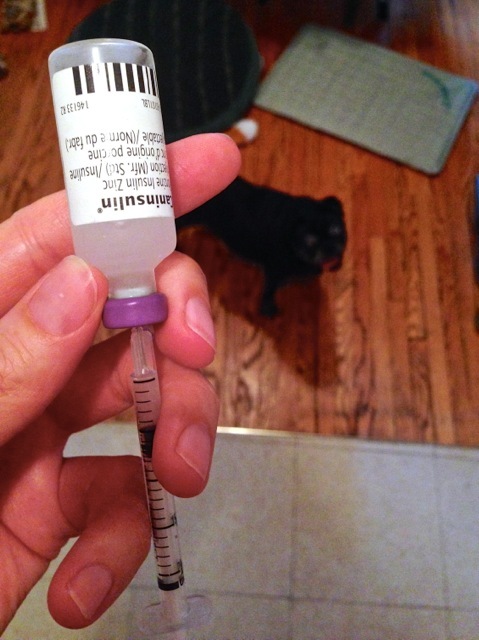 I was definitely more nervous than Nells was when her appointed insulin hour came around. …she was pretty darned excited about what was about to happen. Why would anyone be excited about getting a needle, you ask? 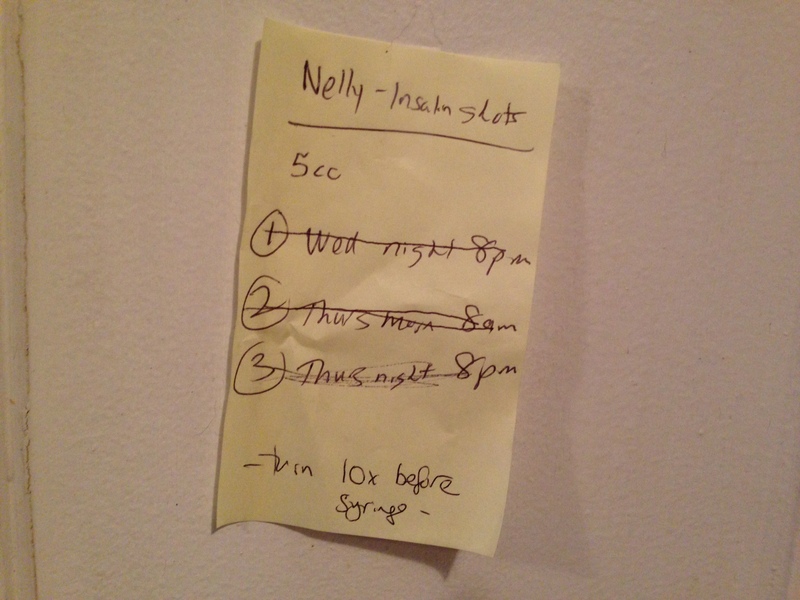 …because giving an insulin shot the right way means getting a second dinner, in Nelly’s world. A little jab with the thinnest of needles in the squooshiest part of Nelly’s ample neck folds was nothing to her. And it was pretty quickly no big deal to me, as well. It didn’t take long for the girls to gang up on me and start to demand some evening entertainment. So now that I’ve earned my Junior Pug lab coat, I guess it’s time for me to put on my adventure cap and get us outside, right? 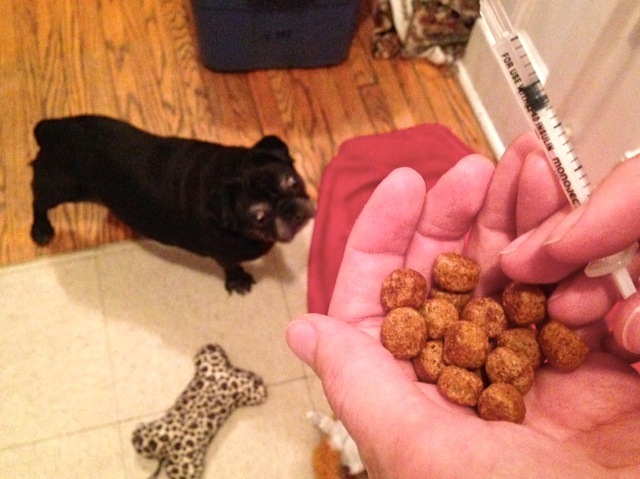 The most amazing thing about this really simple diabetes treatment is that Nelly is doing SO well. In fact, I haven’t seen her this playful and happy in years. So, alright, little ones. I’ll get me adventurers hat on and see what I can conjure up for you. To be continued next Sunday!